Hermes Heavy Duty 80mm A4 2D-Ring Black Polypropylene Box File 8.BA4.001 Pack of 1 Hermes Heavy Duty Polypropylene Box File. Designed to last 5 times longer than standard board box files. A4 with 2 D-ring 50mm capacity mechanism. 80mm with spine label. Integral lid closure. Finger hole for easy retrieval. W80 x D290 x H325mm. Black. Hermes Heavy Duty 80mm A4 2D-Ring Silver Polypropylene Box File 8.BA4.006 Pack of 1 Hermes Heavy Duty Polypropylene Box File. Designed to last 5 times longer than standard board box files. A4 with 2 D-ring 50mm capacity mechanism. 80mm with spine label. 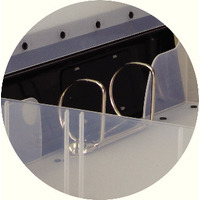 Integral lid closure. Finger hole for easy retrieval. W80 x D290 x H325mm. Silver. 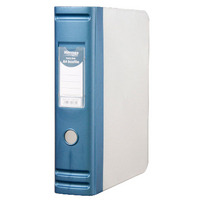 Hermes Heavy Duty 80mm A4 2D-Ring Blue Polypropylene Box File 8.BA4.007 Pack of 1 Hermes Heavy Duty Polypropylene Box File. Designed to last 5 times longer than standard board box files. A4 with 2 D-ring 50mm capacity mechanism. 80mm with spine label. Integral lid closure. Finger hole for easy retrieval. W80 x D290 x H325mm. Blue. Rexel Classic Box File Lockspring Foolscap Black (Pack of 5) 30115EAST Pack of 5 Eastlight Classic Foolscap Box File. Traditional box file designed for strength and long life. 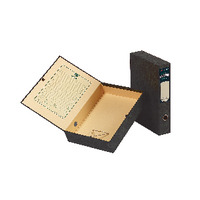 Features include, a mottled Black and Green hard wearing cover, lip clip, plastic Lockspring ensuring contents stay secure and printed index on the lid. 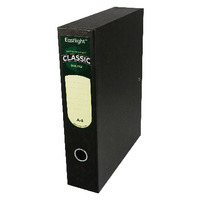 Rexel Classic Box File Lockspring A4 Black (Pack of 5) 30145EAST Pack of 5 Eastlight Classic A4 Box File. Traditional box file designed for strength and long life. Features include, a mottled Black and Green hard wearing cover, lip clip, plastic Lockspring ensuring contents stay secure and printed index on the lid.